Fewer than 10% of all drummers are girls or women. Social and cultural barriers lead many aspiring female musicians to instruments like piano, violin and flute. “Hit Like a Girl” is an annual contest to counter that trend. Organized by big drum manufacturers and magazines, this year’s event drew entrants from ages 6 to 60, and nearly 50 countries. 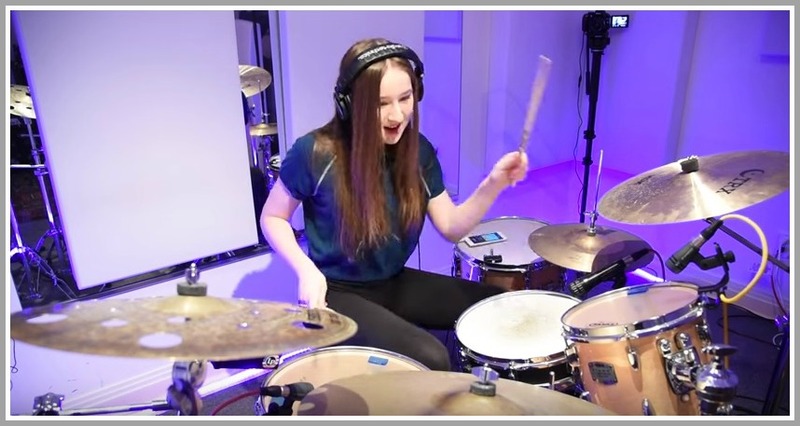 Their videos were judged by top drummers — including those with Beyonce and Red Hot Chili Peppers — on technique, chops, originality, creativity, groove and feel. Last year’s Under-18 winner was from Indonesia. The year before that: Japan. Drum roll, please! The 2016 “Hit Like a Girl” best drummer in the world is … a Westporter. Becca Webster — a Staples High School freshman — beat out every contestant, from around the world. Her runnerup came from Poland. Last year, Becca finished 2nd. She’s won other prizes — including as a soloist with the Staples High School jazz band, and on tour with the School of Rock All-Stars — but this was her biggest stage ever. The call came — of course — while Becca was practicing with a jazz band. In addition to tons of industry exposure, Becca gets a new drum kit and cymbals. Plus endorsement opportunities, and the chance to appear in ads and at clinics. Becca began drumming when she was 3 years old. Her grandmother tapped out a rhythm, and urged the toddler to repeat it back. “Nana” grew up in a tiny apartment in Brooklyn, at a time when girls did not drum. But she started taking lessons in her 50s, and discovered a natural sense of timing and rhythm. When Becca turned 8, her grandmother gave her a drum kit. She worked for 2 years on fundamentals, speed, technique and timekeeping with Tom Geisler, before learning to play songs. The teacher also sparked her interest in jazz. At 10, Becca joined School of Rock. Director Frank Perrouna helped her learn responsibilities, like creating and keeping the groove going. As house band captain for School of Rock’s Fairfield house band, she’s learned to arrange songs, and pick apart every instrument. She’s watched with satisfaction the growth of girl drummers in the area. Some call her their inspiration. Becca’s contest video songs are different from her usual groove playing. But she loves the polyrhythms and layering of parts with each limb. The songs forced her to work on 4-way independence. Lately, studying with Adrian Tramontono of the band Kung Fu, Becca has gotten into jazz/fusion music. Working around his touring schedule, he pushes her on soloing and improvisation. Her goal is to make music her career. Becca would love to become a session drummer, or play in a band. She is just 15 years old. That means Becca has a chance to 3-peat as the Under-18 “Hit it Like a Girl” champ. Unless, of course, she’s too busy playing around the world to bother entering. This entry was posted in Entertainment, People, Staples HS, Teenagers and tagged Adrian Tramontono, Becca Webster, Hit Like a Girl contest, School of Rock, Staples High School jazz band, Tom Geisler. Bookmark the permalink. 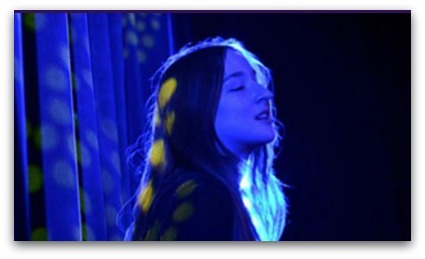 Wonderful story – what true passion for music looks like! ‘Just checked for the SHS Jazz Band Concert: Thursday 6/9. I trust Becca is the drummer! You bet! The SHS Jazz Ensemble has had a great year of competitions and the hometown show should be an awesome one. The kids are so good now. My wife and I have had the pleasure of playing with 3 outstanding female drummers. Two were during college (early 80s) and one was at Bedford MS in 2001 (she would be Staples ’05). We continue to jam occasionally with one of the women from college. They all know the difference between flair and flash, confidence and arrogance. Each was a joy to play with. Best wishes to Becca and all the other young women who want to play rock’n’roll on any instrument. The barriers to access are coming down, so now is the time to chase that dream. Becca is not a good drummer…..
she is an AWESOME drummer. Yeah Becca! This chic is going places. So proud of her. two of my fave drummers to record with in Los Angeles were women… Alice de Buhr ( Fanny), and Terri Lynne Carrington. sorry i’m not young enough to cut (record) with Becca. i did forward the above to Ringo and Keltner ! keep at it, Becca ! Small world Buell, Terri Lynne Carrington was one of the celebrity judges on this contest so she got to review Becca’s video! Thanks for the encouragement. my nephew jake greenwald is in the SOR house band and going to see these kids play rock and roll never fails to delight and amaze. go see them if you can! they blow the roof off, and then eat pizza. congrats becca!! !